For ultra-quiet plumbing a small section of silicone tubing is key. We recommend at least a small piece to isolate pumps from the ridged plumbing. Silicone tubing can kink fairly easily, so it isn’t the best to use in locations with hard bends, however by using a small piece in a straight section of plumbing can soak up almost all vibrations from return pumps and cut down on noise dramatically. Four Sizes Available - Sold by the foot. Just enter how many feet you need, and we will send you a single piece that long. 3/8" ID - Works great for replacement air tubing on most protein skimmers. High quality silicon tubing usually used between pumps and hard plumbing to help reduce vibration. Soft tubing will help dampen the vibration thus reducing the noise. Use with water, air, and food and beverage. Tubing is made from FDA-compliant resins. Material meets ASTM D2000. Tubing can be sterilized with steam (autoclaving) and radiation. When you can't find that specialize tubing and the home improvement/hardware stores or LFS you can always turn to BRS to have what you need! Old tubing had become brittle ... certain tis will hold up a whole lot better! Summary says it all, but this tubing is so flexible without loosing structure it's crazy good, just crazy good. I haven't seen tubing this flexible before. I guess some folks would like some fancy paragraph romancing the product, but plain simple and to the point it's easy to work with, seems to be standing up very well and so far isn't an algae magnet like some other clear tubing products. Simplicity right there. if you are running any type of reactor, this would be the only tubing that I would run. Very durable, and strong, just wish it was in a solid color. Just installed this tubing and it was incredible how it dampened my return pump noise. Super happy! I replaced some standard braided vinyl tubing on my Eheim 1262 return pump, set the pump on a silicone trivet and has literally turned my return silent! the loudest part of my system is now my skimmer which is still very quiet, I will never use anything else. Thank you BRS for introducing me to this! This tubing is very useful when making tight bends. Much better than multiple elbows. High quality, food grade I am happy with it. I heard about using silicon tubing to quiet down pump noise on a Youtube video by BRS. I was skeptical but tried it. it works great. My setup has never been quieter. I have a 75-gallon tank, with the pumps and apparatus in the basement. Still, vibration crept up the PVC and resonated in the stand. The silicon tubing made a huge improvement. This was some of the best money I have spent on my aquarium. If you value quiet, get some of this tubing. After using hard pipes and PVC braided tubing for all of my sumps for over 15 years, I seemed to be chasing the pump drone in almost all of them. This stuff eliminated 95% of noise, and the tip of putting an OXO silicone dish pad under it (thanks to BRS video suggestion) it's dead silent! I'll be swapping all of my sump pumps to this ASAP. Finally found a clamp that fit the 3/4 size its tefen acetal snap grip hose clamp 26mm b0060g3y70,. Hello what is the OD of the 1/2 inch ID silicone tubing? The OD is just around 11/16” and the ID is exactly ½”. Can this tubing (1" id) be used right off the return pump barb adapter to connect directly to the return overflow pipe instead of using vinyl? Can it handle 800-1000gph without bursting? I don't want clear tubing because of algae growth and the only vinyl tubing I can find in black with a 1" id is pond tubing and is not flexible at all. In fact, while trying to service my return pump, because the tubing is so rigid, it broke the seal on the bulkhead. I am looking for something more flexible to work with. My run goes right from the pump to the bulkhead piping from the overflow. These will have 1/8" wall thickness on average. Feel free to let us know if you have any further questions! I have the 1/2 Mur-lok RO Inline Ball Valve Push Connect that come with the BRS deluxe GFO reactor, what size tubing goes into those. Is it the 3/4. Also I assume if you want 6ft you put 6 on the quantity as well. Mur lok fittings will not work with Soft tubing. 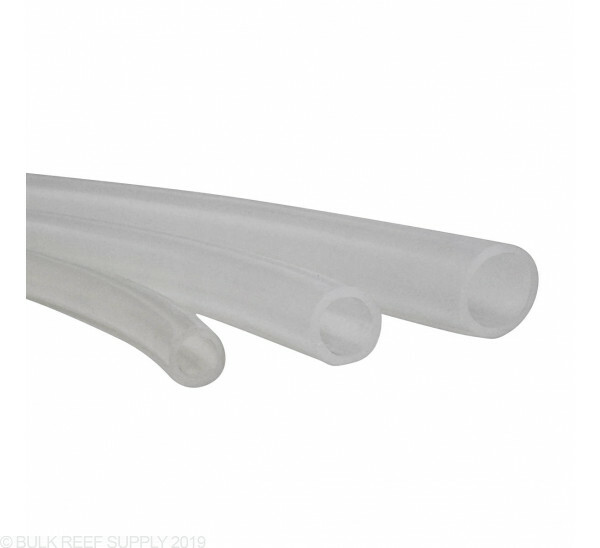 You will either need Polyethylene tubing (under RO tubing in the 1/2" size) If you prefer to use soft tubing it will be 1/2" and you can use a mur lok stem x barb adapter. Quantity 6 will receive one 6' tube. Can this tubing be used for Apex DOS and DDR? For the Neptune DOS and DDR you will want to use the DOS replacement tubing in the link below. While the silicone hose is quite a bit more expensive than alternatives, if you wish to you, you certainly can use it for your drain lines. What is the correct size ratchet clip to use with the 1inch inside diameter silicone tubing? Thanks in advance. Similar question submitted in the ratchet clamp section. We use the 1" clamp with 1" silicone tubing. Pressing the end of the clamp together with pliers will be needed to make a complete connection. Feel free to let us know if you have any further questions! How long is a short piece of 1" id tubing ( in and out of an iwaki pump ) for vibration reduction? We find the longer segment of soft tubing the greater the reduction. Up to 6" of tubing can be used to help with keeping vibration down. Feel free to let us know if you have any further questions! What diameter fis what barb? What tubing Inneed for a 3/4 inch barb? The 3/4? Is this platinum cured silicone tubing and what exactly is that? Soft Tubing is not rated for much PSI (In the range of 10-30 PSI) These will last for years in the aquarium but 5 year replacement would be necessary. Additionally as long as used in aquarium applications the tubing will work great! I want to build a diy peristaltic pump. Would your hose work well for that? Not really, You would need some type of surgical tubing which will last and be much more consistent and accurate. How flexible is this hose? I would like to use it for water changes. Is it a suitable product for this purpose? The silicone tubing is super flexible, even more flexible then upbraided vinyl tubing and without being warmed up as well so I don't see any reason why you couldn't use silicone tubing for that. It can be used where just about any flexible tubing would be used. Its benefit is largely that its really soft (which reduces vibration) so most folks just use a short length to connect to there pumps to reduce noise, though there is no reason you can't use it for longer runs.